A couple of weekends ago, I had some friends from Karlsruhe visiting so we could celebrate my birthday and also have a mini flat-warming type thing. A couple of days before, I just happened to see on a Basel meetup group that on that very Saturday there was a “Tag der offenen Türme”, Day of Open Towers. 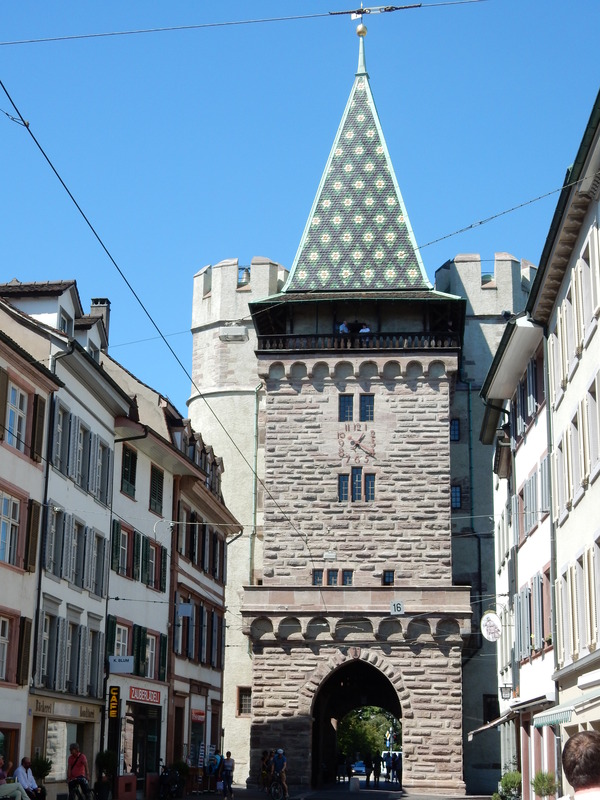 In other words, the remaining towers of Basel’s old city walls were opening up for one day only (usually you can only look at them from the outside). Four towers in all were opening up, but that seemed like a bit much for one afternoon, so I decided it made most sense to aim for just one. I chose Spalentor because it’s the prettiest looking (from the outside, in my opinion) and also the closest to where we live. Also, it’s practically in the town centre so we could walk on to some other tourist sites after viewing the tower. The week before had been cloudy and not all that warm, so I was relieved to see Saturday dawning with bright sunshine. Climbing a tower only to see clouds isn’t much fun! Inside the tower, there were various interesting items of furniture on each level and also a fascinating little room! Finally we reached the top and were able to look out over the roofs of Basel and the very pretty street that the tower/gate is located in. Most of what we could see from the top of the tower wasn’t actually all that interesting so those are the only photos I took from up there. But it was interesting to actually go inside the tower that we’d driven past so many times while flat hunting. And I still think the outside is very pretty. It seems the Tag der Stadttore (Day of the open city gates), to give it its official name, is an annual event, so maybe next year I’ll get to see the inside of another tower! I’m linking this post up to Monday Escapes with My Travel Monkey and Packing My Suitcase. Click the button to find out more!